You may know the Great Egret by the name of the Great White Heron. They don’t weigh more than a few pounds. They look very graceful in flight with a wingspan that can be up to 85 inches. In flight they retract their neck so that is an easy wall to tell them from Storks and Cranes. They are about 3 feet tall when they are fully mature. This particular bird it white in color with a large body. They have thick feathers and a very long neck. The beak is thin and long and a yellowish color. They have black legs that are long and skinny – resembling sticks. They are curious birds that are also very intelligent. They are able to fly for long distances without stopping to take a rest. This particular bird tends to live in locations that offer it a warmer climate. They are found in the tropical areas around the world. You will find them living all across the Sun Belt. 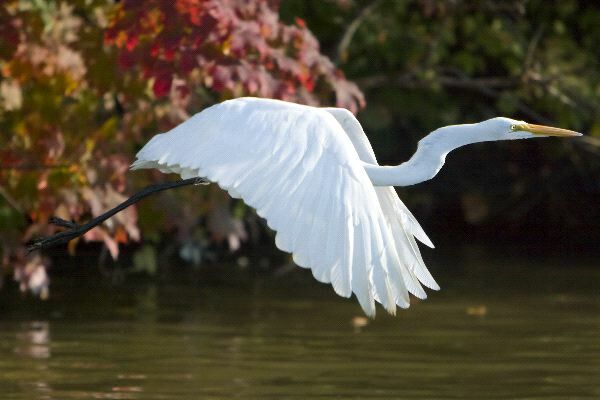 The Rainforests of South America are also home to the Great Egret. They are migratory and they will move to warmer locations in the winter months. They live around fresh water, salt water, and the wetlands. During mating though they will give out loud calls to try to find each other. The males are more vocal than the females because they are also warning off other males in the area at the same time that they are trying to attract the females. They can be aggressive when they are looking to mate or when they are tying to protect eggs and chicks in a nest. 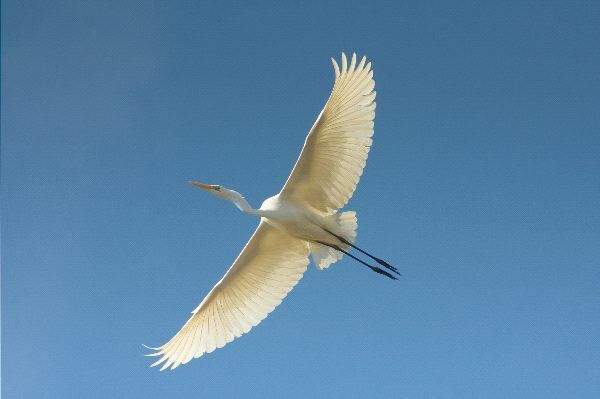 The diet for the Great Egret includes frogs, fish, and small reptiles as well as small mammals. They tend to eat in the shallow waters or along the dry habitat around the water. They use their sharp bill to spear their prey and then they swallow it whole. In some locations they are found on the bodies of Buffalo because they can eat various insects and grasshoppers there. When it is time for mating the Great Egret will nest in trees and create colonies. After a pair has mated it will be several weeks before the young arrive. They females can deposit up to four eggs into their nest. Both of the parents take care of the young in their nests. There can be a great deal of fighting among the first chick to hatch and his siblings. The weaker ones may be pushed out of the nest and they will die. This is natures way of ensuring the strongest and healthiest of the Great Egret are able to thrive. The average life span in the wild for this species of bird is 15 years. The numbers of the Great Egret are good at this point in time. They weren’t always that way though but thanks to some committed conservation efforts they had the chance to increase in population over time. They were often killed for the great looking feathers that they offered. In fact, their population dropped a lot of what it should have been at one point. For the past 100 years though they have been increasing in numbers and their genetic pool has been diversifying. There have been intentional breeding programs in captivity too that have helped to keep a strong line of genetics in place for the Great Egret.